Written Belching Out Crass Laughs by Bridger Cunningham. The Queen of Coarse Humor, Roseanne, made her triumphant return on March 27 to ABC. After a 21-year absence, many beckon why so many shows of sitcom past are being revived. In Roseanne's case, the proof is in the ratings pudding. The series graced the top 10 from 1988-95, tying with The Cosby Show during the 1989-90 season. The series recharged Tuesdays, as well as positioning ABC to take 1st Place during the 1990-91 and 1993-94 seasons. So how did this revival come about? 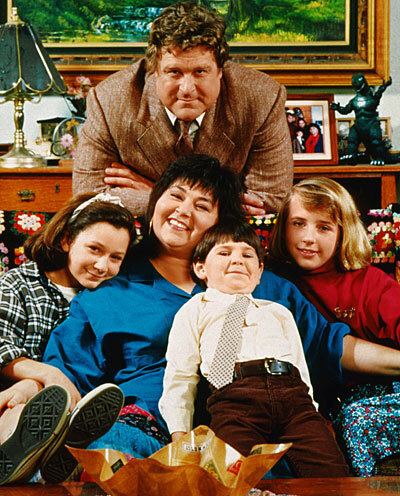 Long before the revival trend became the fad of this decade, Roseanne Barr regularly discussed revival possibilities in the 2000's, giving colorful sketches of where the Connors were in the world following the 1997 finale. Barr placed Darlene (Sara Gilbert) now divorced from a philandering David and revealing she was a lesbian. Becky (Lecy Goranson) would be widowed from late Iraqi war vet Mark Healy (the late Glenn Quinn) and working at Walmart. And Dan (John Goodman) would have faked his death and undid the bittersweet last five minutes of Season 9's finale. Season 2 managed to regularly challenge the aging Cosby Show as Roseanne spent the arc of the season seeking menial jobs to make life work. Bartending, groveling to a punk teenager boss at a fast food joint and finally washing down the unpleasantness as a shampoo lady at a welcoming salon. The laughs continued, as well as finally meeting the Connors' parents. The series managed to tackle social issues such as teenage drinking and Jackie joining the local police form. The season ended on a beautiful note as Roseanne's family surprised her with a writing room, helping her achieve a long-lost dream she forfeited to support her family. The third season experienced a slight drop in the ratings yet delivered on top as Roseanne moved on to become a waitress at Rodbell's. West was upgraded to contract status as Crystal fell in love with Dan's much-older father Ed (Ned Beatty), later becoming pregnant and marrying him. Jackie was injured in the line of duty and broke up with her fiancee Gary. Season 3 also introduced Becky's punk boyfriend Mark Healy (Quinn), who became an instantaneous nuisance to the Connors. The kids aged into appropriate stories, and the season ended with Dan taking a risk and opening Lanford Custom Cycle. Social relevance ramped up during Season 4 as the opening episode featured Becky asking Roseanne for help obtaining birth control pills. Darlene sank into a realistic bout of depression, and Roseanne and Jackie's parents divorced, ultimately revealing her father had a mistress for 20 years and was also abusive to his family. Roseanne also faced an ultimatum and had to undergo a breast reduction to alleviate a struggling back. Dan's shop struggled, and Roseanne lost her job as Rodbell's closed. Jackie explored a new career in truck driving, and Crystal became pregnant again, delivering a baby girl. Despite this darkness, the laughs continued to roll and the series experienced a 10.3% spike in the ratings, pushing back to 2nd place. Things change, and not just the Conners both being unemployed. The series downgraded West to recurring status, and Lecy Goranson elected to leave the series to attend college. To accommodate this, writers had 17-year old Becky elope with Mark, and the pair appeared sparingly throughout the season. Scraping to get by, Jackie and Roseanne teamed up with recent divorcee/bisexual friend Nancy Bartlett (Sandra Bernhard) to open a diner, The Lunchbox. The only caveat was the sisters had to agree to allow abrasive mother Beverly (Estelle Parsons) to be their fourth partner in the venture. Jackie began seeing a much younger man, who eventually became abusive. Aside from the adult's woes, Darlene's stories developed to prominence as her relationship with Mark's brother David (Johnny Galecki) was explored. After discovering his homelife was toxic, Roseanne allowed David to move into the Conner's crowded home. The season ended with Darlene being admitted to college early as Sara Gilbert elected to attend college but remain on the show. Major changes came about as the series elected to recast Becky with actress Sarah Chalke. Laurie Metcalf became pregnant in real-life as Jackie became pregnant as well. This season highlighted Jackie experiencing her deepest character growth via this story as she delivered her son Andy and eventually married his father, Fred. After insulting Bev for the last time, she delivered a devastating dose of spite and sold her share to Leon Carp (Martin Mull), Roseanne's much hated, openly gay former boss. Ratings slid as the series aged, yet delivered in a solid 4th Place. The season opened with Roseanne announcing a late in life pregnancy. The wrinkle upped the ante as Roseanne herself announced a real-life pregnancy. 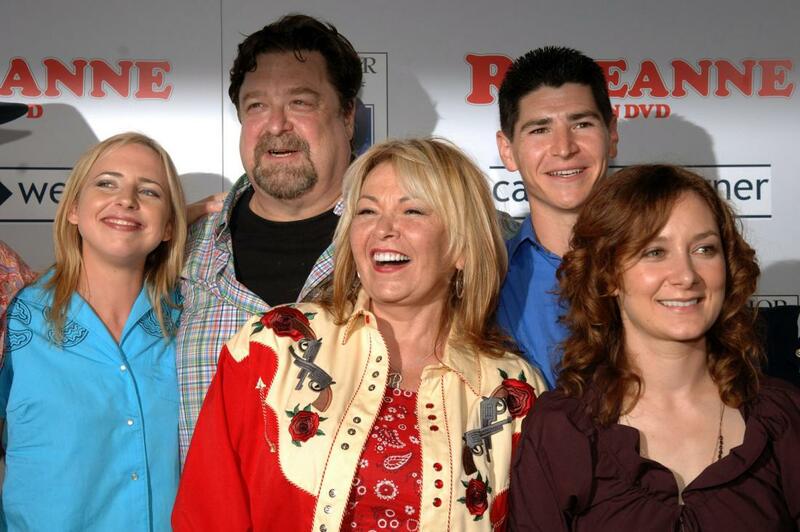 After being placed on bedrest, Roseanne's presence was diminished this season. During that time, Jackie and Fred's marriage crumbled, Darlene and David separated and Becky and Mark struggled to make a young marriage work. That, along with changes in writing tone, led to the ratings sliding again to 9th Place. Still, Season 7 held the strongest focus on social relevance. Eyed initially as the last season of the series, Roseanne fell out of the top 10 after being moved to Tuesday at 8:00 to plug the hole left by cancelled Full House. To celebrate the last season, Lecy Goranson returned for the season, ousting Chalke. As Goranson's busy schedule limited her availability, Chalke and Goranson simultaneously shared the role. 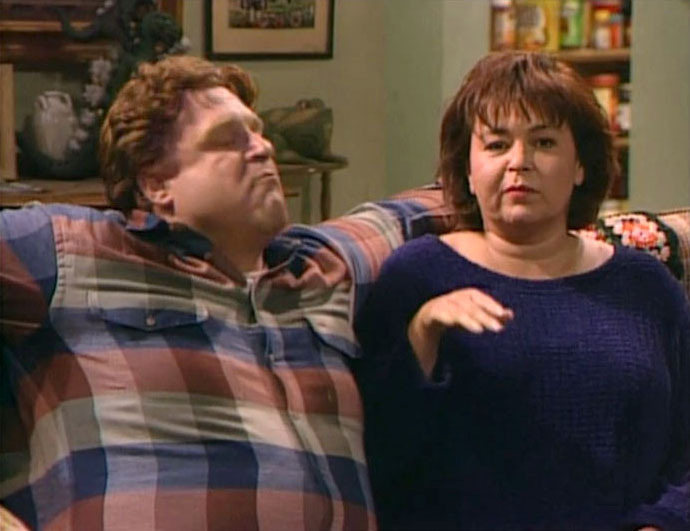 Roseanne delivered her son Jerry on Halloween, and the remains of the season directed toward neatly wrapping up the series. 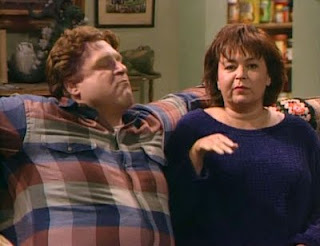 In early 1996, showrunners announced they planned another season, changing the tone when Darlene became pregnant, resulting in an impromptu wedding and Dan suffering a heart attack. The season ended in a stunning separation for Roseanne and Dan. Sarah Chalke returned full time as John Goodman limited his role for the last season. Departing from the blue-collar tone as Roseanne won the lottery, the 9th season featured Roseanne and company departing on outlandish adventures. Despite this arc, serious stories such as Dan's adultery, Darlene's daughter arriving prematurely and Beverly coming out as a lesbian altered the tone as the series sought its ending. All appeared to be coming to a happy end until Roseanne shocked us in the finale. The last five minutes of the series revealed several shocks. Roseanne never won the lottery, Dan died following his fatal heart attack, and Jackie, not Bev, was a lesbian in real life. And the Healy couples were reversed with Darlene and Mark paired as well as David and Becky. Praised and lambasted all in one fell swoop, the finale seemed to make a revival impossible. ...Or did it?